The Recent Garden News page displays the fifteen most recent additions to Mooseys Country Garden. This should help visitors keep up with what's going on in my garden. Gardens are always growing and changing - there's always something new to see. And, as I love writing about my garden almost as much as being in it, there'll always be some new Moosey ramblings to read, or new pictures to look at. Perhaps the garden activities of my summer will warm up a northern hemisphere gardener's winter days. I know how much I enjoy my mid-winter garden visits to summery places. Oh, sneaky, sneaky autumn! You're starting to colour up rather nicely. But oh so subtle are your changes, at this early stage. And no frosts as yet, so the dahlias bloom on. The Silver Birch by the cottage has gone golden. Leaves are starting to flutter down. I love autumn. Over the next days and weeks this gardening journal just might become obsessive and repetitive. It's open fire season. So cleaning up my burnable messes is pretty much all I can think of to do, each day. Or not, like today - yeay! It's too windy. Am thrilled. Gardeners are allowed - just sometimes - to be uninspired. It's OK to have a few 'off' days, particularly when shrubs are being eaten by opportunist caterpillars, and Eucalpytus tree leaves keep fluttering down, covering lawns and borders, making everything look scruffy. Thoughtful times processing the nasty events in my city, puzzling over what happened, worrying about why, then feeling sad. I'm very thankful to my garden for keeping me company - and my daft dogs, cats, and kittens. And Non-Gardening Partner for doing some chain-sawing and (oops) weed killing (just the driveway) for me. It's early morning, the 15th March, and I've written a good things list, which I have cleverly disguised in some sentences. Firstly, nothing hurts. Phew! And all my choirs are singing well. Overnight irrigation (plus early morning rain) has blessed my garden with plenty of water. It breathes a sigh of relief. I've been working really hard these last days, trying to reclaim gentle control over my messy garden. Co-operation is in both our interests. I'm happy looking at pretty things. My garden is happy when it's looked after and nurtured. This should be a win-win situation, us two working together in blessed harmony. Never apologise, right? So a garden visitor from England appears out of the blue, and much of my garden is uber-messy. 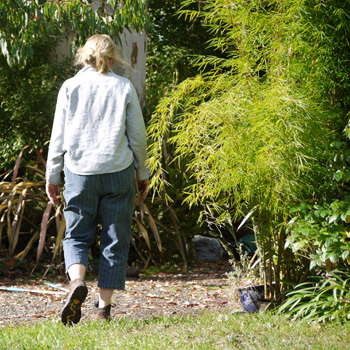 Eucalyptus leaves cover the gardens, lawns and paths, so walking anywhere is 'crackle and crunch' noisy. My March mess is out of control, and I spend an uncomfortable hour apologising. Aargh! Messy March. A very messy fact of my gardening life. Autumnal? I think I'd rather like that. Cooler temperatures on the evenings. I'm liking this! The first of the autumn bonfires? Welcome to the March Clean-Up? Not quite liking this as much. Inspiration to do garden maintenance comes from the oddest sources. First thing this morning I read my latest Fine Gardening Magazine. I put it down, finished my cup of tea, and vowed to clean up my patio garden and the driveway. Just like that!